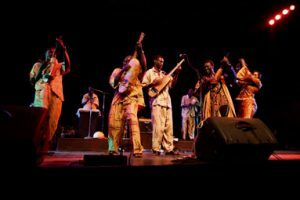 Malian master Bassekou Kouyate and his band Ngoni band will grace the Wexner Center Performance Space this Friday November 18th in the first ever appearance in Columbus. Bassekou and his band mesmerize audiences with the driving sound of their four ngonis—a small, lute-like stringed instrument that’s the forerunner of the banjo. Their music springs from deep roots in griot traditions but also taps into modern themes and shares the bluesy overtones of Ali Farka Toure, Toumani Diabate, and other famed musicians from Mali. Kouyate and his crew’s pulsing Afro-pop sound also has traces of jazz, bluegrass, and wah-wah-pedal-powered rock that propels its unique melding of the ancient and the future. Now signed in this country by stalwart indie label Sub Pop, Kouyate and Ngoni ba are experiencing an upsurge of intense interest from a new crop of fans intrigued by the rippling rhythms of African music that have inspired such bands as Vampire Weekend and Dirty Projectors or captivated by the younger generation of Africa innovators that includes Tinariwen, Konono No.1, and Staff Benda Bilili. Next post: Columbus Jazz Orchestra & Helen Welch reunited for "Home for the Holidays"